Married, wedded, knot tied, vows exchanged, “hereby” issued, hitched. Yes, I got hitched, and nothing says “newlywed bliss” quite like an etymology. Whence the Middle English hitch? Some cite the Middle English icchen, “to move jerkily,” where the trail ends; others look to variants in hatch and hotch. Partridge focuses on the latter, positing the Middle High German hotzen, “to shake.” Weekley also focuses on hotch, but connects it first to the French hocher, “to shake,” as in hocher la tete, “to nod the head.” This hocher, he says, is also behind the first element in hodgepodge. With an earlier form of hotchpotch, a hodgepodge was once a kitchen-sink sort of stew but earlier said “of lumping property before division (? by shaking up names in a pot).” The original French was hochepot, “soup,” with the sense, I’m guessing, that one continues to stir certain soups so it doesn’t settle. Whatever the case, Weekly goes on, like Partridge, to link the French hocher to the Germanic hotzen, source also of hustle, a “shaking” of money in a cap. Hustle? Hodgepodge? Hitch? I’ll stick with another h word: honeymoon. The Mashed Radish will be back in June. 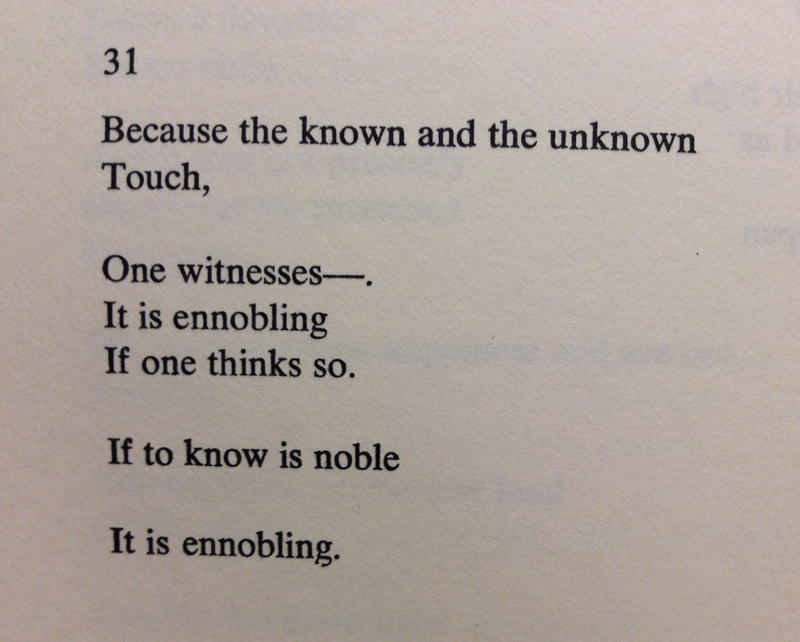 Oppen, “Of Being Numerous.” New Directions Books. Indeed, there is a lot going on here. But there is more to Oppen’s connection between knowledge and nobility than a poetic, perceptual, and epistemological one. There is an etymological one. I’m not trying to be cunning in making this uncanny connection, even if it could seem a bit academically uncouth, abnormal, or even a bit quaint. But I can, I’ll have you note, and I don’t think it’s beyond your ken (and you’re pretty keen), so I’ll narrate so, for all these words are cognate to know. Last post, we looked at the surprising origin of the suffix –lock. We entertained, too, the possibility that the suffix explains the second part of the word knowledge. The first part, of course, is know. What do we know about know? Old English had cnaw, Proto-Germanic had *knew-, and Proto-Indo-European *gno- and *gen-, among other base variations. The root is simple: It means “to know,” but, boy, did it go on to accomplish a lot. I can’t pretend to be exhaustive, so here are some highlights. Can, as in, “Yes we can,” is a widespread Germanic word and took the form cunnan in Old English. Now, it’s a modal auxiliary verb but is rooted in the sense of “to have learned” and “to come to know,” thus “to be able.” It is connected to *gno- and *gen– via “to know how” to do something. Could is technically the past tense of can but also expresses indefinite possibilities. In Old English, the past tense of cunnan was cuðe, and the l came about by analogy to words like would and should in the 16th century. Some cite cunning–originally meaning “learning” or “widsom,” now a noun and adjective naming sly skill and artfulness–as the present participle of cunnan (think run and running), though the Oxford scholars link it to the Old Norse kunnandi. Old Norse has kunna, “to know,” a close cousin of can. Cunnan‘s past participle was cuð, meaning “known” or “familiar.” It became couth, which really only survives in the negative, uncouth, which evolved from “unknown” to “unsual” to “awkward” to “unrefined.” A clipped version, unco, is Scottish and Northern English. Ken, which I’d guess is becoming fast frozen in the phrase “beyond my ken,” was “to make known” in Old English. It’s technically a causative form of cunnan. As a verb, it survives in Scottish English. It was also once a nautical term for “range of sight,” measuring distances at sea. Kenning, if you’ve ever studied Beowulf, is related. Con may evoke con artists or conventions, but it is also an obscure verb meaning “to learn” or “study.” It is from a variant of cunnan. Ability, possibility, craftiness, appropriateness, vision, learning, all kinds of sharpness–none of these are possible, *gno- teaches us, without knowledge. In part 2, we’ll pick up with what Latin did with *gno-, and, in turn, all the fun we’ve had with it. In a few short weeks, I’ll be married. So, naturally, wedlock has been on my mind. Literally, the word wedlock has been making my fingers flip through dictionaries. OK, I’ll admit this transition is a bit inelegant, but, rest assured, etymology does have its romantic side. Specifically, I’m interested in the second half of the word: –lock. What’s going on with it? First, the –lock in wedlock has nothing to do with the kind of locks we need keys for. Undoubtedly such locks do inform our understanding of wedlock, though. Two persons, bonded together, locked without a key…I mean, sealed and united together for a lifetime. This association is folk etymology but exerts its influence nonetheless. Perhaps, though, wedlock is not alone in its vestigial –lac. What might keeping it company? Knowledge. Ironically, we don’t know knowledge as well as you’d think, not to mention its complicated relationship to acknowledge. Obviously, knowledge is a compound, composed of know and, well, the second part. In Old English, the word was cnawlecce. You might see how cnaw became know, from the prolifically prolific Proto-Indo-European root *gno-. Can, cunning, could, uncouth are all cognate, to name an oh so short, English few. We do know, though, that the transformation of –che to –dge is something also displayed in partridge and sausage, for whatever it’s worth. Speaking of knowledge, do we know anything else about this –lac? Connections can be made, through the Old Norse leikr mentioned above, to “various Indo-European verbs applied to activities such as playing, leaping, springing, dancing, fighting.” Other scholars see connections to words for dancing and singing hymns. Ultimately, these verbs–possibly including the verb, like, you know, like and the suffix –ly–may go back to the Proto-Indo-European *leig- or *loig-, meaning, variously, “jump, hop, tremble, bounce,” and “shake.” It’s unclear whether it’s causative–”to shake” or “cause to shake,” but these distinctions blur and merge, ultimately–but what we’re getting at here is the basics, anyways. Our language–and in my book, our thought–is a thing of nouns and verbs, of objects and actions. While stuffed with abstractions like suffixes such as –lock, these are handy shortcuts for those base metaphors that I like to fancy is our more essential human experience in the world. See Spot run. It’s simple but it’s beautiful: This running is conceptualized, almost Platonically, as Action, associated with core efforts like playing and fighting; the linguistic mind, the human mind, transformed it into a portable, modular bundle of meaning. And yet nothing could seem more essential. So, see Spot run. And play. And jump. And dance. And get married. And research and write word origins. It’s simple but beautiful. I am not one for posting on consecutive days, but today marks one year since I first launched this curious endeavor. I looked through all the many words I mashed up these 365 days–86 focal words, to be precise–and it indeed tells a story. From one angle, it tells my story, beginning the project in Minneapolis and continuing on in Laguna Beach, California, with new work and adventures along the way, with sundry interests and concerns riddling the post week after week. From another angle, it tells our story, with words inspired by news that broke throughout the year or prompted by the very events we use to measure our lives year after year. And from yet another angle, I like to think it tells (a very small part of) our broader, human story, glimpsing ever so briefly into how we perceive, structure, and communicate our thoughts, our lives, our worlds through words and their changing meanings. What is year, anyways? Year is a from the Old English gear (“year”). The Oxford English Dictionary can date it before 960. It many Germanic cousins all descended from a Proto-Germanic *jeram or *jærom, meaning the same. Other cognates include the Greek hora, source of Latin hora, French hore, and English hour. The Greek hora meant “season” or “part of the year” as well as “part of the day,” hence, ultimately, hour. Directly, historical linguistics reconstruct a Proto-Indo-European *jer or *yer for year and meaning the same, but a possible, deeper Proto-Indo-European origin is in ei (“to go”) might explain year as “that which goes” or “that which passes.” (This little verb lives on in everything from exit to ion to sudden.) What could be more basic, more essential, more appropriate? Indeed, I go on. Thanks to you, my readers, followers, commenters, and retweeters, who’ve chased many an etymological rabbit down the hole with me in this period. I am not one to get too personal either, but special thanks, too, to my fiancée, who I get to call my wife later this month, for putting up with my many hours with my head in dictionaries and fingers at the keyboard. 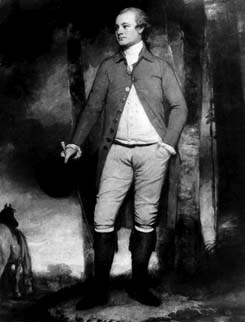 In 1780, the 12th Earl of Derby instituted an annual horse race at the Epsom Downs near Epsom, England. It was called the Epsom Derby, so named from his title. This earldom is so named, of course, for Derby, the shire or town in England. For my readers outside of the UK, Derby is well north of London and Epsom is a bit south of the capital. So, the race was not run in Derby but is named, ultimately, after Derby. Ready for a ride and race, the 12th Earl of Derby. Image courtesy of the Wikimedia Commons. Stateside, the derby lives on most famously in the Kentucky Derby. Indeed, Epsom Downs notes more than 140 races worldwide have adopted the toponym–not to mention the borrowings seen in roller derbies and demolition derbies. The Kentucky Derby itself is famous for its hats, although the derby hat, American English for the bowler hat, is no longer at the peak of its popularity, if you will. Magritte’s “The Son of Man,” a derby-donned self-portrait. Image courtesy http://www.renemagritte.org. The bowler is named for the surname of its creator, so why the US usage of derby that emerges in the 19th century? Etymologists speculate that the derby is perhaps named for those worn by the “famous sportsmen, the Earls of Derby” (Partridge) at the races. The jury is out, but their verdict favors that Derby comes from the Old English Deorby (also recorded as Deoraby, and much later, the variant Darby). If this is so, the place name may be a compound of deor (“deer”) and by, from the Scandinavian byr, a “village” or “town.” You might recognize this by in bylaw, a local law, from the Old Norse. By the by, the preposition by was also used in place names, so the English by and Scandinavian by experienced some cross-influence. So, if you’re at the Derby, live it up. No, literally, live it up and enjoy the Kentucky “Breath-Be.” OK, I might be chomping at the etymological bit, but run with it, will you?